Here at Wright Solicitors, we know we cannot take away the pain when a family breaks down, but we can help ease it. We have a dedicated team of family lawyers who will offer you a caring, approachable and professional service. Through understanding, practical solutions and prompt action, we will provide you with a flexible and responsive service with continued support and advice throughout. Our experienced team of family lawyers will provide you with a bespoke service, tailored to your specific needs and we also have a range of fixed fee services which offer great value for money and we also offer legal aid to those who are eligible. Whether you are thinking about a divorce or separation, or want advice in relation to children matters, financial settlements within divorce, or any other family matter, our family lawyers can help. 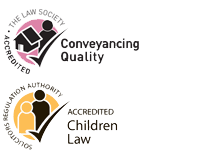 We are all committed to the Resolution Code of Practice, which promotes an approach to family law that is sensitive, constructive, cost-effective and most likely to result in an agreement. We understand that it is not always easy to find time to visit your solicitor because of work, heath and life commitments, so to ensure we are accessible to our clients we are open Monday to Friday from 9am to 5pm. We can also offer appointments outside of normal office hours by prior arrangement. Give us a call or send us an email to find out more about what we can do to help.